The exhibition explores the evolution of computing – from the days when computers were so large that they would fill a room, to the personal desktop computers of the 1980s and 90s, and the earliest handheld devices. Exhibits on display include early examples of home computers such as the iconic BBC Micro and Sinclair ZX81, as well as some of the first portable personal computers that paved the way for today’s tablets and laptops. 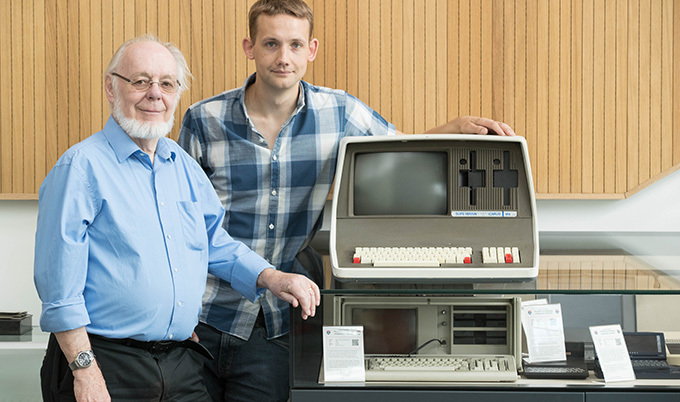 The exhibition has been put together by a group of volunteers from current and retired staff and students, led by researcher Jonathan Dowland and Professor Brian Randell, who joined the computing department at Newcastle in the late 1960s from IBM's T J Watson Research Center in New York. Among the veteran models on display is the vacuum-tube technology of the type used in Ferdinand, the Ferranti Pegasus computer which was the very first computer at the University. Installed in November 1957, Ferdinand - FERranti DIgital and Numerical Analyser Newcastle and Durham – is thought to have been the first computer in the whole of the North East. As there were so few computers at this time, access was also made available to local industry, and major local companies such as C.A. Parsons, Reyrolles and Thomas Hedley were among those interested in Ferdinand’s capabilities. To use Ferdinand, programs were prepared on paper tape which was then loaded into the computer by Elizabeth Barraclough, the University’s first Ferranti Pegasus computer operator, whose long career at Newcastle culminated in the role of Director of the University Computing Service. In 1967, 10 years after its launch, the computing department had grown substantially, and the University – by then separate from Durham – obtained the IBM System 360/67. At the time, this was the largest IBM computer in any British university, and components from this will be on display during the exhibition. It was also Europe's first time-sharing computer - a computer that could be used simultaneously by a number of different users, dramatically lowering the cost and speed of developing and running computer programs. The original purpose of the computing lab at Newcastle University was to provide computing support to researchers. It quickly became clear that education for users was essential, and in 1958 Newcastle became the first British University to teach a course in computer programming to undergraduates. Today Newcastle is ranked one of the top universities in the world for computing science. This status as a world-leading centre in data science led to Newcastle leading the UK’s £30m National Innovation Centre for Data. It also has been named as the Governmental Academic Centre of Excellence for Cyber Security Research, as well as being invited to join the prestigious Alan Turing Institute, the flagship national institute for data science. Professor John Fitzgerald, Head of the School of Computing, Newcastle University, added: “Sixty years on, computing science teaching and research at Newcastle continues to be ground-breaking, allowing us to be at the forefront of critical disciplines such as big data, artificial intelligence, cyber-security and cyber-physical systems. The History of Computing exhibition has been designed as part of Newcastle University’s ‘Inspired by’ Great Exhibition of the North programme. It is taking place in the entrance to the Urban Sciences Building, Newcastle Helix, weekdays 9.00am – 5.00pm and runs until 9th September.